Make sure to log on to the Chesco Mom Facebook page TONIGHT at 9:00PM as we are are in give, give, give away mode. We are going to throw a few fun 80’s trivia questions out via our Facebook status. Don’t worry this isn’t a first anwser first win type of deal. We we will switch it up so lots of ladies have an opportunity to win, not just the 1st to respond. Some questions will be for the second, third or fourth.. and maybe even 10th gal to respond. The end result is that if ? ?th Facebook friend gets the question right via comment they win the fabulous prize! Woo-hoo! All of the questions will include the name of prize up for grabs and all that we ask is that you only participate in the questions for the prizes that you really would like to win as to not take a chance of winning away from another mom. Stay tuned for updates throughout the day! C-ya on Facebook at 9:00PM! Not a Chesco Mom facebook friend yet? 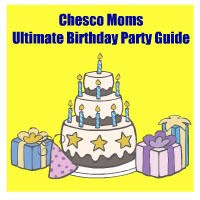 No worries… to join in on the fun make sure you become a Chesco Mom Facebook friend by 8:00PM tonight!